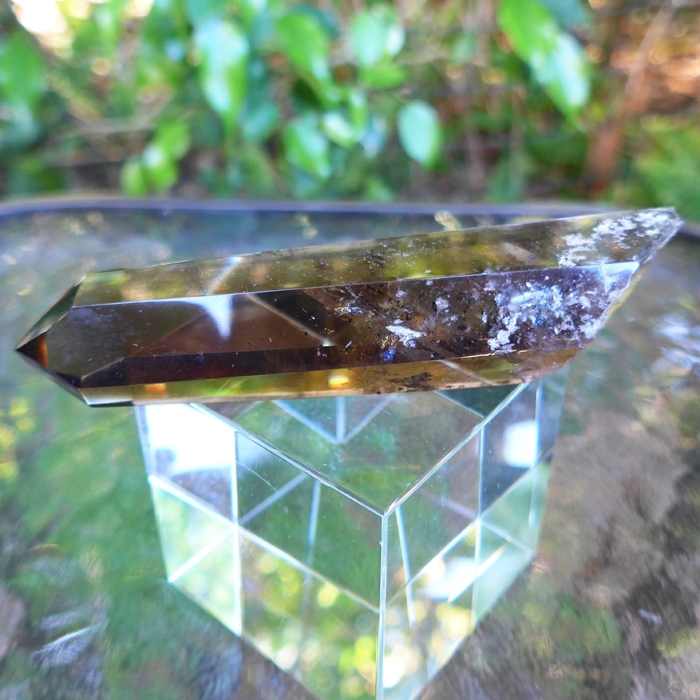 Dimensions (HxWxD): 4.75" x 1.15" x .75"
This powerful and beautiful 4.75 inch long Shadow Lemurian Channeling Polished Wand, weighing 116 grams, has tremendous inner clarity and a rich deep glowing coloration with stunning specks of anatase visible in light. 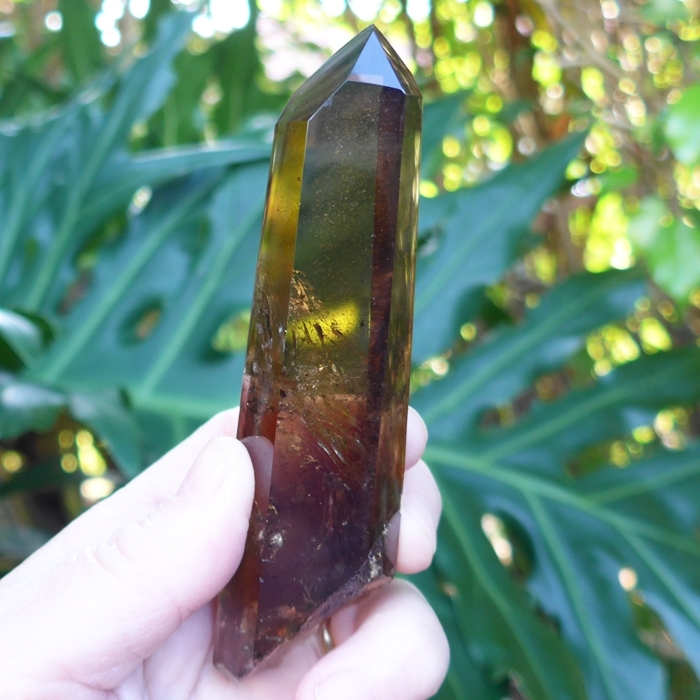 This crystal is from a new find in the Serra do Cobral Mountain range in Brazil, where both the old and new Lemurian mines are located. Read about the mineralogical and metaphysical properties of Lemurian crystals of various types in our new online book Spirits of Stone. Read Chapter Two & learn about the history & use of Lemurian Seed Crystals. See new photos from the Lemurian mines of the Serra do Cabral and a map of the mines. Lemurian seed crystals like this one are perfect examples of a crystalline structure created by what is known as the Muzo crystal growth habit. 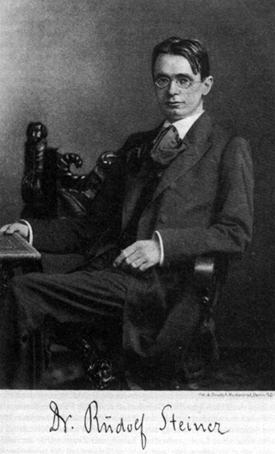 This habit was first described by Rykart, commenting on crystals from Muzo in Colombia. A similar crystal habit or structure has also been found on rock crystals from pegmatites in Minas Gerais, Brazil, and from alpinotype vugs in Switzerland. Many Lemurian seed crystals display the defining characteristics of the Muzo habit. Muzo habit crystals display horizontal striations up and down the shaft, and can form very steep termination tips, such that a cross section of the upper end of the shaft appears triangular, although the lower body of the shaft remains hexagonal in shape. These Muzo habit crystals are also known as laser wands. 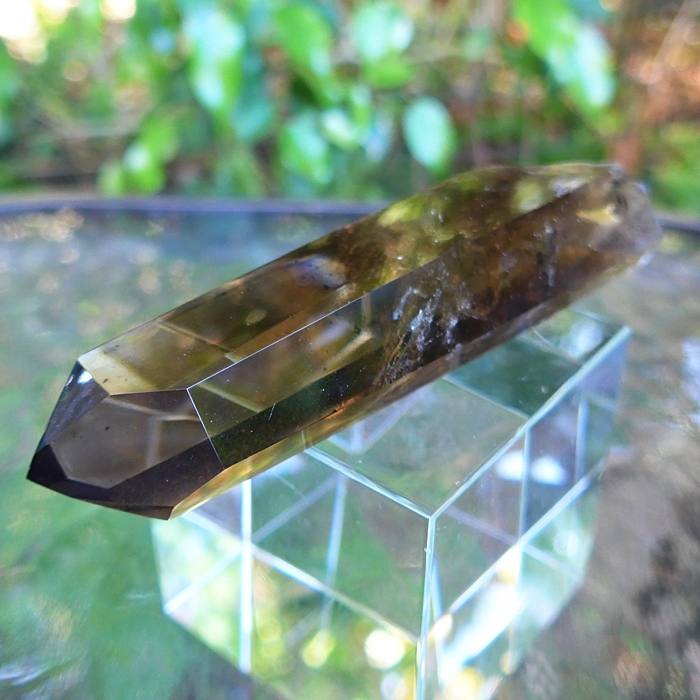 Smoky Citrine Lemurians also referred to as Shadow Healer Lemurians are a combination of smoky quartz and citrine. Smoky Citrine is a stone of transformation, an alchemist’s stone. Smoky Citrine Lemurians facilitate a smooth and easy, graceful access to a very deep place when doing inner work. Smoky Citrine combines the energies of these two powerful types of crystal. Smoky quartz and citrine are both found in high-temperature hydrothermal veins in Brazil, and both are used to transform negative or unwanted energies. And in conjunction with the energy signature of Lemurians, these stones are a powerhouse of tranformative energies. Lemurians occur naturally with multiple striations and it is thought that these striations contain information from ancient civilizations. They are tuned to energies of unity, and help us to balance the spiritual and physical aspects of our lives. Place the striations on the third eye or place the finger on the striations while meditating, or just place the crystal on your meditation cushion or altar nearby you. They are said to have been left behind by an advanced ancient civilization known as the Lemurians. Lemuria is said to have been an intuitive, spiritual civilization. 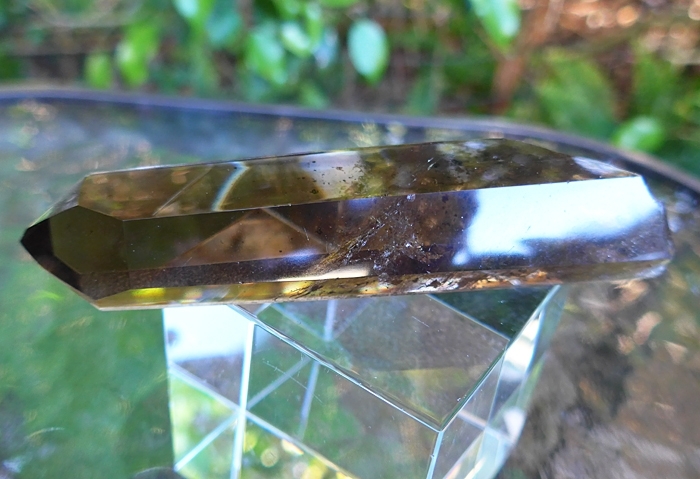 Jane and I have used these Smoky Citrine Shadow Healer Lemurian crystals in meditation and in our Reiki practice, and we are amazed by their complex and powerful energy. During meditation and in Reiki sessions, we found that they impart a deep, nurturing warmth, most noticeable first in the “hara” center, the storehouse ofUniversal Life Force Energy, or “chi”, located two fingers width below the belly button. This warm glow expanded throughout our bodies, then extended out into the aura, enlivening and brightening body, heart, and spirit. We also found Shadow Lemurians to be very helpful companions during sleep cycles, triggering profound dream experiences, helping us recall meaningful dream experiences, and gently triggering needed catharsis of negative emotional baggage. Reiki clients report that Shadow Lemurians provide a warm, nurturing, yet energizing effect on the body and mind, noticeable for periods of time up to several days after treatment. 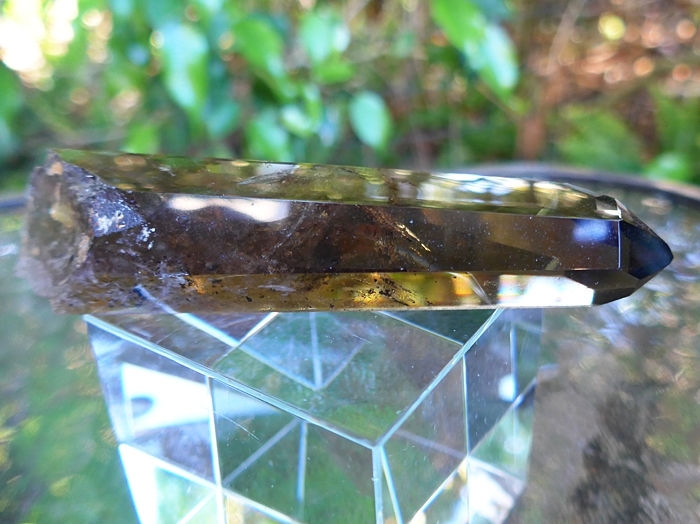 Smoky quartz "tends to refine the vibratory energies when one is in the state of meditation," Melody explains, "allowing for both the clarity of thought and the elimination of impeding will-fulness. It can be used to initiate a powerful force field which will absorb many forms of negativity, both from within oneself and from other sources." When we have used citrine in Reiki and crystal energy sessions with clients, they have reported feeling a golden glow around them. We have also found that citrine is a powerful tool for extracting negative energies, gently dissolving energy blocks, and releasing negative emotions during sessions. Above weight is shipping weight. Net weight is 116 grams or 4.9 ounces.